Unleashing a torrent of destruction in the wettest storm to ever hit the Carolinas, Hurricane Florence engulfed farms, overflowing open pits of hog feces; flooded coal ash ponds, inundating waterways with toxic byproducts; killed dozens, and destroyed thousands of homes. California wildfires, Hurricanes Harvey, Maria, and now Florence – there is nothing “natural” about the havoc wreaked by these recent disasters. The five hottest years on record have all occurred since 2010. Higher temperatures and extreme weather patterns make wildfires more likely and more severe, while warmer sea temperatures and rising sea levels “supercharge” hurricanes, intensifying their impact and damage. 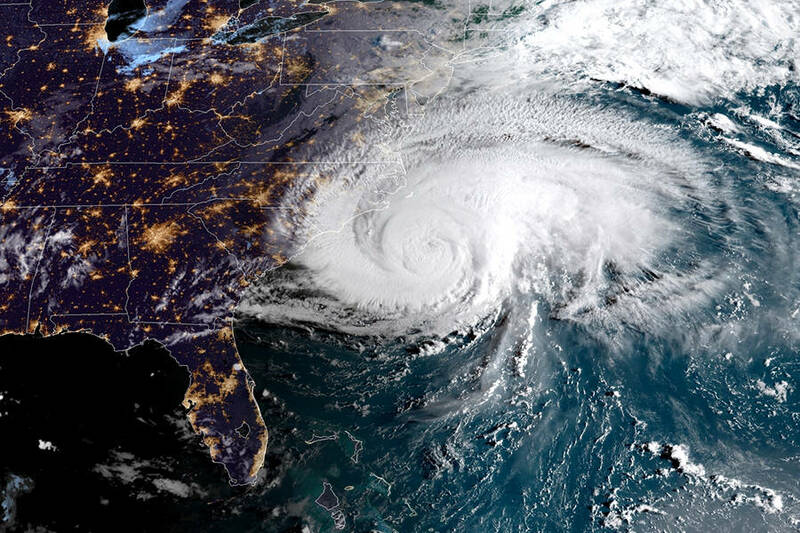 One study estimates that climate change increased the volume and extent of rainfall from Florence by 50%. The impact of these storms is amplified by politicians from both parties who protect the profits of big business and wealthy developers over the interests of working people and the environment. Most of the nearly 3,000 deaths from Hurricane Maria were caused not by the storm itself but by systematic underfunding of basic public services and an abysmal response from the Trump administration which left many in Puerto Rico without electricity for 11 months. In 2012, in order to artificially prop up real estate values, conservative North Carolina lawmakers even passed a bill preventing policy makers from using the latest science on rising sea levels to plan for coastal development! Trump, a climate denier, has blatantly prioritized his reactionary agenda – especially attacks against immigrants – over the needs of the millions affected by Hurricane Florence. Estimates project Florence’s damage to tally $38-$50 billion. But what has the Trump administration focused on instead? Further underfunding disaster response, diverting $10 million from FEMA to fund immigration detention centers. Many undocumented immigrants in areas affected by the storm understandably feared deportation if they sought help. An ICE spokesman said that they would not carry out raids in areas affected by the storm, yet an administrator with FEMA also said that he could not “guarantee” that undocumented immigrants would be safe. Politicians and their corporate backers often emphasize the importance of a consumer driven approach to solving the crisis facing the environment. This can be seen through the new drive by food chains to minimize their customers’ use of plastic straws. Yet this greatly misses the mark on the who the real drivers of climate change are. Just 100 companies are responsible for over 70% of global emissions. Even if carbon emissions stopped today, we would still see effects of climate change and rising temperatures. The real culprits in the intensifying climate crisis are massive corporations and the politicians who refuse to bring them to heel. While Trump and reactionary Republicans represent the most egregious refusal to act on climate change, we can’t rely on simply electing Democrats to address this crisis. In response to Trump pulling out of the Paris Climate Accord, California’s Democratic Governor Jerry Brown organized the Global Climate Action Summit, where politicians, business leaders, and philanthropists discussed steps to address to the climate crisis. But their proposed “solution” still falls short of the commitments made in Paris Climate Agreement. The Paris Agreement itself, even if fully implemented, would still fail to keep global warming under two degrees Celsius, an amount that already would have a dramatic impact on the environment. The impending catastrophe of climate change cannot be resolved through piecemeal, market-based reform. Earlier this year, under pressure from below, the Democratic National Committee voted to ban contributions from fossil fuel companies. Within two months, they had completely backtracked and tried to cover their capitulation to the energy industry by citing objections from some unions. Too often, substantial action on the environment is falsely pitted against the preservation of union jobs. A socialist plan for the environment would create millions of living-wage jobs, taking the big energy companies into democratic public ownership, retooling them for green production, and transitioning all workers in polluting industries into living wage jobs. Under capitalism, natural disasters are used as an excuse for corporate interests and real-estate developers to ram through privatization of housing, education, and infrastructure, leaving working people to foot the bill. Imagine if, instead, we prioritized climate resilience and genuinely fighting climate change with a massive public investment in renewable energy and energy-efficient technologies to rapidly replace fossil fuels. Only a planned economy, democratically controlled by workers, will be able to transform the profit-driven, fossil-fuel reliant capitalist system to a green economy that can meet the needs of people and the planet.